Its been awhile. 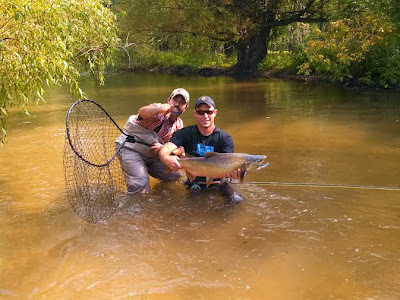 2013 was filled with some great fishing trips, the arrival of my son Blake [on opening day of trout season], a busy and rewarding work schedule, and construction on my basement which have all kept me from writing. Were still getting fishy here in Michigan and I hope to breathe some new life into AO for the new year. I've had a little downtime over Christmas break and have made some changes to the site that I have been thinking about for awhile; a new look and new content. 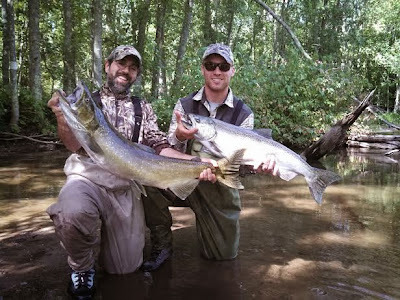 We love fly fishing and it remains my passion and favorite way to chase fish in our rivers. Michigan is a very seasonal region that also offers phenomenal warm water lake fishing as well as gear fishing on the Great Lakes. Its close to home for many and I plan to share some of this content moving forward. I have organized the tabs above for quick reference. I have also added a photography page which is still a work in progress. We fish in some beautiful place and I'm typically snapping photos along the way. Kyle D is doing well out west and has done an outstanding job keeping things going around here. We have a trip planned this winter to fish the Olympic Peninsula in Washington. A shot at a 20lb wild steelhead buck while swinging flies in true spey water has been keeping me laying awake most nights. I'm also traveling to Western Alaska this summer for Silver and Rainbows on a 100 mile rafting trip. Should make for some great stories and impressive fish. Stay tuned!